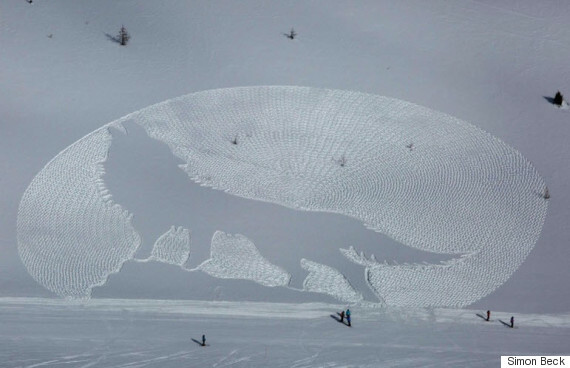 The astonishing snow art of Simon Beck has finally made its way to Alberta's mountains. Beck, a British snowshoe artist, has been carving out masterpieces in snowy vistas around the world for years. He's become famous for his large scale designs of snow symmetry, and now he's created a few for Albertans to enjoy. So far this trip, he's created a wolf howling at the moon at Lake Louise Ski Resort, a maple leaf at Sunshine Village Ski Resort, and a geometric snowflake on Peyto Lake. Beck creates about 30 snow drawings per year, mostly in the Alps, reports The Guardian. An expert in orienteering, Beck uses a compass and set of plans to measure how many steps will be needed for each part of the drawing before he sets out. These images sometimes take more than 11 hours to make and Beck can walk up to 40 kilometres per creation. According to the Calgary Herald, Beck is in Alberta as a guest of Banff Lake Louise Tourism.